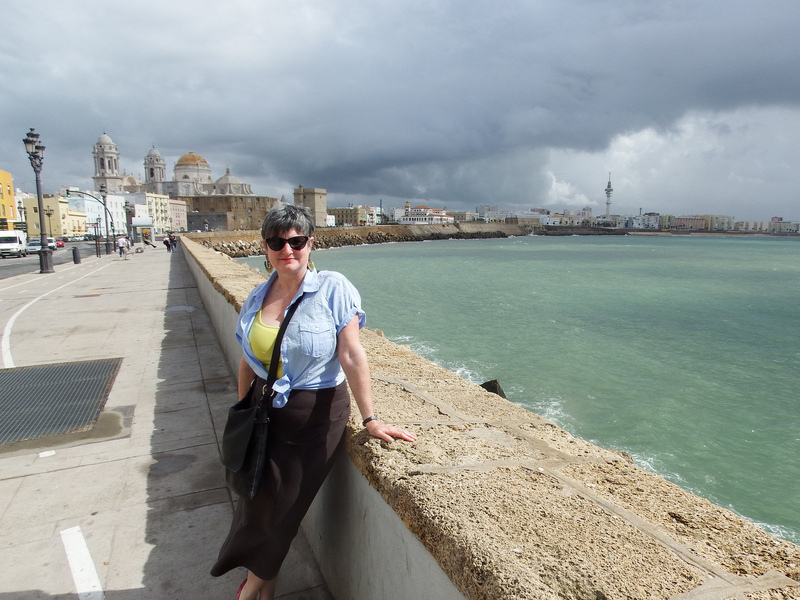 Annie with the vista of the south side of Cádiz behind her. …falls, thankfully, mainly somewhere other than on Cádiz in October, which meant that my partner Annie and I had a delightful break in Andalucia and remained dry for at least five of our seven days away. Admittedly, we did get soaked on the last two days (we actually spent our final day in Seville), but this did not dampen our ardour for this, one of Andalucia’s often overlooked cities. Sited midway between Gibraltar and the Portuguese border, Cádiz stands on a narrow spit of land, connected to the mainland by the most tenuous of threads. Take a look at a map or Google Earth — it really is the most remarkable place, and oddly reminiscent of Venice, minus the canals. As someone fascinated by military history, I was in my element. 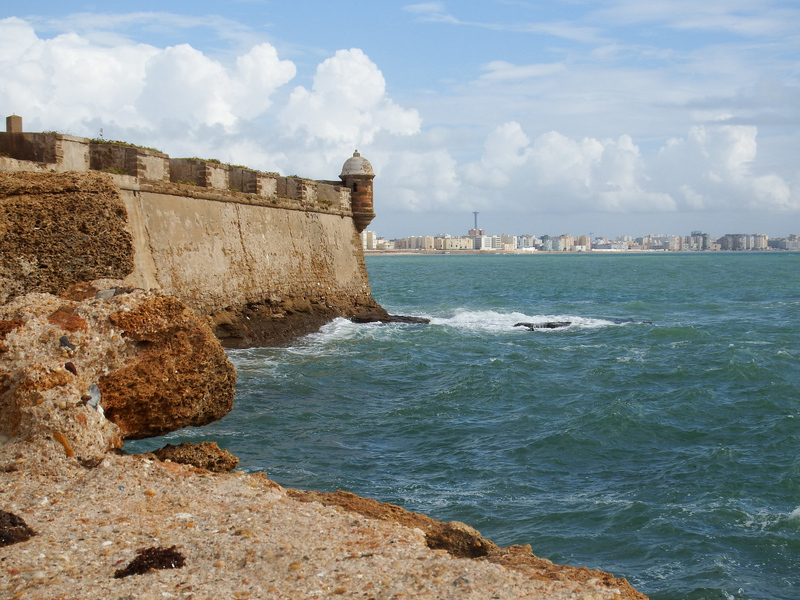 The old town of Cádiz, located at the northern end of the peninsula, is surrounded by fortified walls, a magnificent piece of military engineering dating to the end of the 18th century. Their slopes of pale cream masonry, dotted with bastions and bartizans, are mightily impressive, especially since most of them are either intact or in the process of being lovingly restored. The view from Castillo de San Sebastian, looking back at the city of Cádiz. The fortress is at the end of a long, narrow casuseway. The interior of the city benefits from this military town planning, with long, straight streets criss-crossing the town, opening at intervals onto wide, pleasant plazas that are filled with busy Gadetanos from dawn until late at night. One of the nicest surprises was to find entire families, often spanning three generations, promenading late into the night in the humid air after dining in one of the city’s hundreds of taperias and restaurants. The narrow streets, lined with balconied buildings that rise four or five storeys on either side, echo with chatter and laughter and the music of spontaneous flamenco guitar, as locals practice complex chords amongst crowds of clapping onlookers. 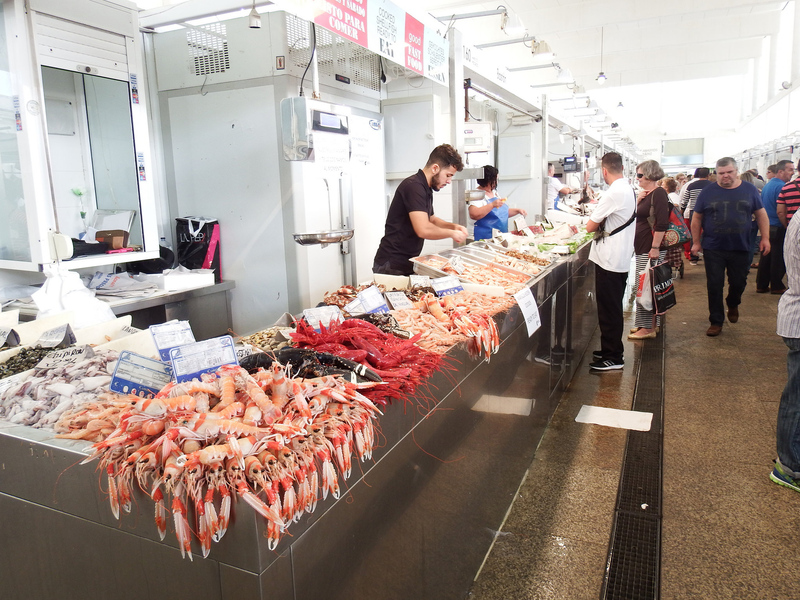 By day, one of the best places to visit is the central market, a cornucopia of delights from sea and land alike. In the centre of the square, the fishmongers, their counters groaning under the glistening weight of huge tuna and swordfish, shark and cod, surrounded by a glistening array of clams and cuttlefish, bream and bass, squid and snapper and a myriad smaller fry. Around the inner perimeter, booths stuffed with cheeses and meats in abundance alongside snack bars serving succulent tapas and rolls, whilst the outer walls house greengrocers, big bunches of bananas hanging from hooks, whilst stacks of oranges and tomatoes and peppers tempt the eye from afar. Thank goodness for the bars nearby, serving chocolate and churros to restore one’s energy! Magnificent crustaceans in the central market. And the food… I have fallen completely in love with tapas, served at breakneck speed by ferociously hard-working waiters in tiny, galley-like taperias, accompanied by ice-cold Tio Pepe fino sherry. Course after course of little dishes, often just a couple of mouthfuls of culinary joy, served in quick succession, most very simple (jamón ibérico de Bellota, tortilla, ensaladilla), others more exotic (chicken breast cooked with almonds and white sauce, confections of duck or wild game with fruit sauces), but all, without exception, sublime. 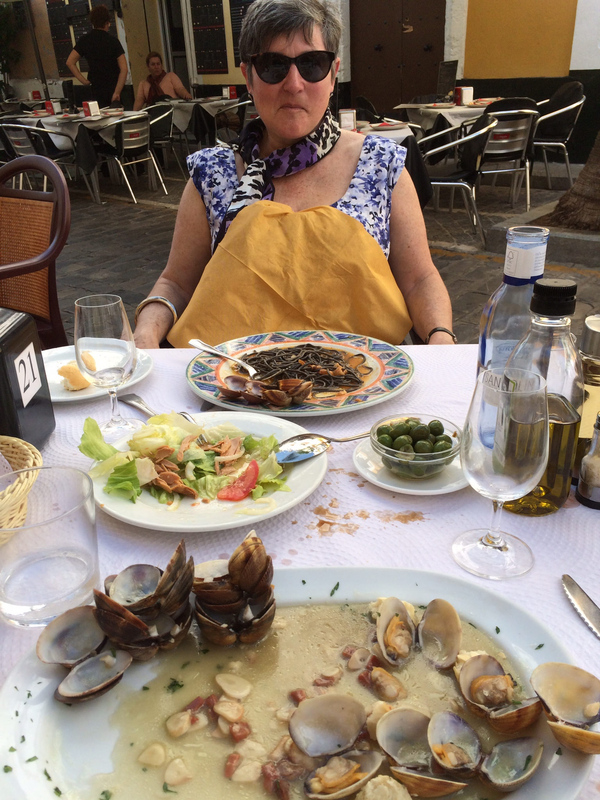 And then the seafood, presented with few frills but utterly memorable, such as the langostinos de Sanlúcar (prawns the size of small lobsters) or clams with ham in sherry sauce. And, of course, paella. 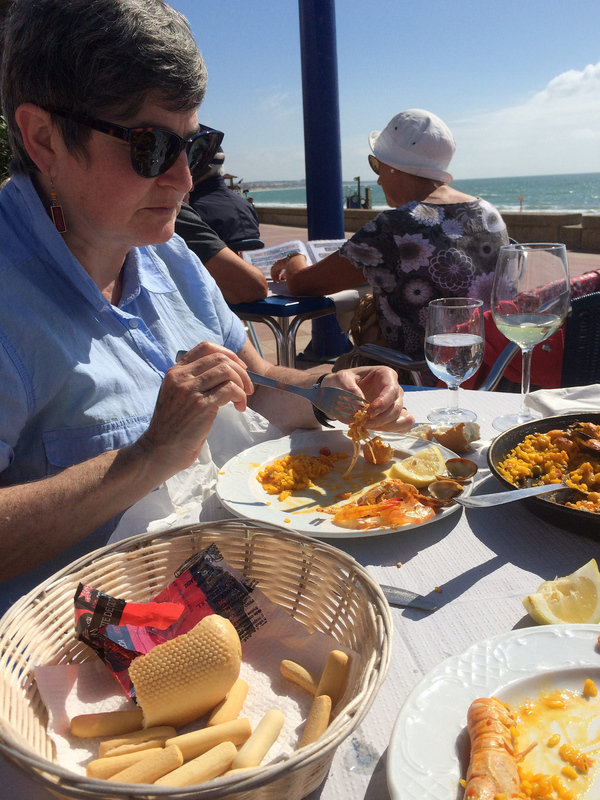 The one we ate at a beachfront restaurant in Playa de Barrosa was the finest I’ve ever eaten. Paella at Playa de Barrosa. Fortunately, neither Ann nor I are vegetarians, because we discovered that even our requests for a simple, mixed side-salad came generously laced with tuna! Most vegetables come stuffed with something (occasionally rice, but often seafood or cheese), or chopped up finely to create the salsa served with many meat and fish dishes. Another fabulous lunch in Cádiz. We made a couple of excursions, one to sandy Sanlúcar de Barrameda, and another to Playa de Barrosa (searching for a Peninsular War battlefield now largely gobbled up by modern housing developments and golf courses) followed by the delightful Vejer de la Frontera. This little hilltop village is one of the famous pueblos blancos, the white-walled Moorish settlements dating back to the middle ages, and still highly atmospheric. It’s more affluent than when we first visited 15 years ago, with new bars and cafés and taperias — and even a community cinema! But the view over the plains below is still breathtaking and we shall certainly be going back. The deal was sealed when we decided to pay a brief visit to the hotel we stayed at all those years ago, only to discover that the young woman who worked on the reception on 2000 is now the hotel manager — and she remembered us! The panorama south from Vejer de la Frontera. We’ve been back home for two weeks now, and whilst we’ve been to Spain before, I’ve never felt quite so connected as during this visit. Perhaps it’s because I made the effort to improve my smattering of Spanish before we went (thank you Audible, downloadable courses are a real boon) and practiced it whilst we were there. Perhaps it’s because our apartment was located right in the heart of the old city, and the views from our rooftop terrace across the city were amazing. Perhaps it’s because I was so ‘tuned in’ to the history of the place. The view over the rooftops of Cádiz from the roof terrace of our apartment. 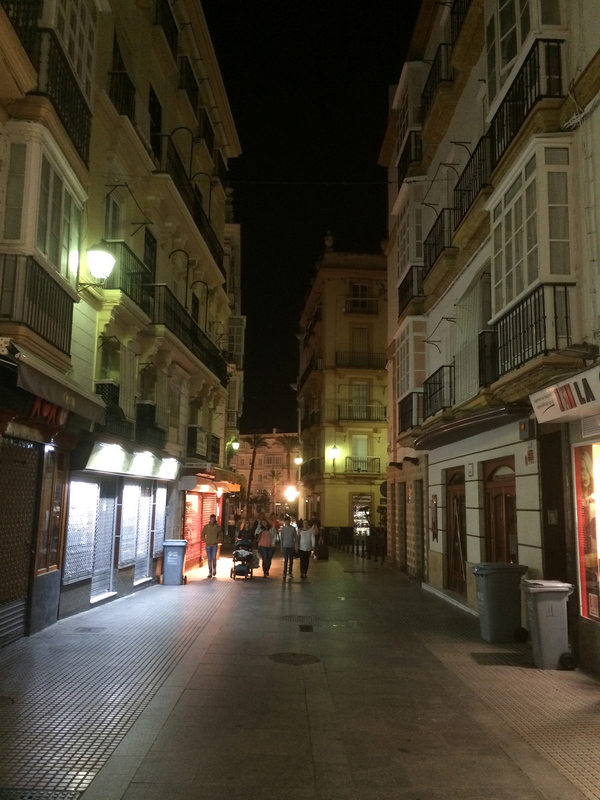 But, most of all, I think it’s because I felt very much at home in Cádiz. We heard hardly a word of English being spoken, and it certainly isn’t ‘touristy’ in the way so many Spanish resorts are. The other holidaymakers there seemed, in fact, to be mostly Spanish. What a refreshing change! It’s a proper, working town, with a busy port and bustling commerce, but the Gadetanos know how to relax, and invite you to relax with them. I miss it already, and I’ll be back.